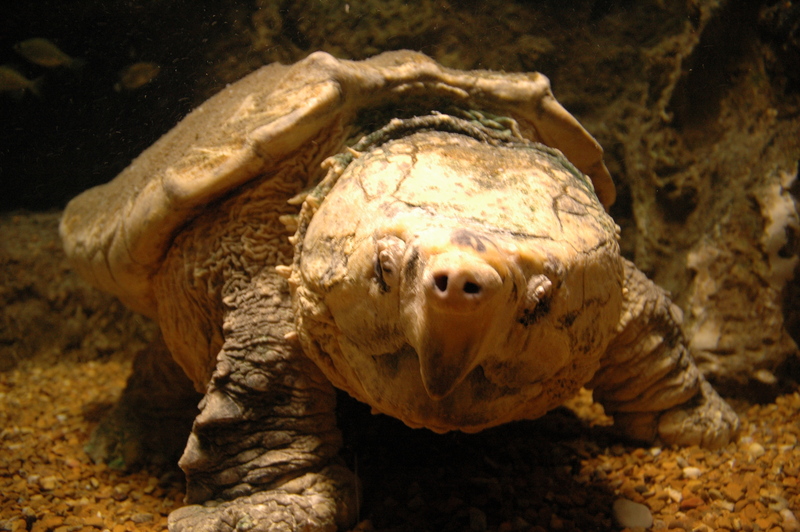 At more than 100 years old, Thunder the alligator snapping turtle is the oldest animal at Newport Aquarium. If you came to Newport Aquarium when it opened to the public May 15, 1999, chances are you got to see our large alligator snapping turtle, graciously named Thunder. If you’ve been to Newport Aquarium recently, chances are you’ve also spotted Thunder. At more than 100 years old, not only is Thunder the oldest animal at Newport Aquarium, he’s also one of the original animals to go on display when we first opened. Since the aquarium opened, Thunder has been in a tank near the Gator Alley exhibit. That is up until last week, when he was moved to the “Temple tank” at the new Turtle Canyon exhibit, which opens to the public March 22. Alligator snapping turtles are one of the largest turtle species in North America. Across the U.S., populations of turtle species – including alligator snapping turtles – face a variety of environmental issues including water quality, habitat loss or degradation and hunting. Saved from a butcher’s block, Thunder was rescued from a Louisiana market because of his large size. He moved to a turtle farm in Missouri before calling Newport Aquarium his home. Due to both these natural and synthetic factors, the United States Fish and Wildlife Service lists alligator snapping turtles as an endangered species. These factors are also why it’s rare to see an alligator snapping turtle the size of Thunder in the wild. Thunder, like other alligator snapping turtles, is an ambush predator and prefers to hide and wait for his food to swim by. Then – SNAP – he catches it by surprise. Newport Aquarium biologists describe Thunder as a picky eater, especially when it comes to mackerel. He gets fed roughly twice per week, but can go weeks without eating due to the low amount of calories needed. Often you can find smaller fish swimming in the tank with Thunder as he awaits for a larger, more appetizing meal. If fish enter his tank small and grow to be medium-to-large sized, Thunder probably will not try to eat them. However, if you were to throw in a large bass into his tank, after an about hour chances are Thunder has taken a bite out of it. One of the unique personality traits of Thunder is his penchant to practice yoga in the mornings; keepers often spot him stretching out his limbs first thing in the a.m. This entry was posted in Turtles and tagged alligator snapping turtle, Thunder, turtle, Turtle Canyon, turtles, TurtleTuesday by NewportAquarium. Bookmark the permalink.